To experience the Namib Desert and Sossusvlei from above is a truly unique experience. 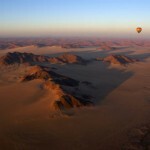 When you glide silently and quietly with the hot air balloon over the impressive landscape of the Namib, you’ll experience a unique blend of the spectacular colors of the desert. 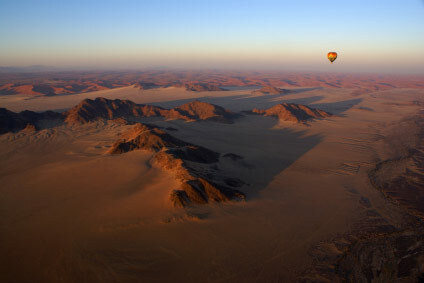 The balloon rider over the dessert takes about an hour, depending on the wind strength the hot air balloon covers a distance of about 10 miles. 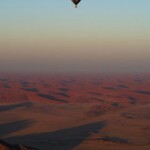 Flights over Sossusvlei start from different lodges or camp sites in Sesriem. 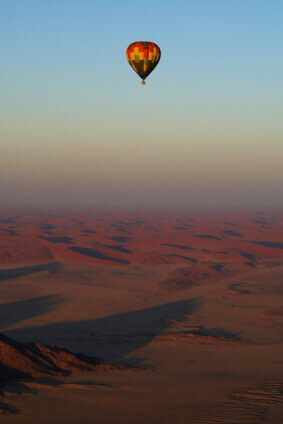 It starts about an hour before sunrise, because the cooler the air, the better the balloon can fly. The organizer namibsky.com picks up guests from their accommodation. The day before you will be notified of starting time based on weather conditions. It may happen that a planned balloon ride has to be postponed or canceled due to unforeseen weather conditions. The hot air balloon is met on the ground after flights by an SUV that transports the balloon driver back to the starting point after landing. Then the guests usually expected a stylish champagne breakfast amidst the impressive scenery of the Namib Desert. The costs per person will be 3500-4000 NAD which corresponds to around 300 to 400 euros. Children may fly with the balloon from a height of 1.30 meters, as they only can see from this size over the edge of the basket. The organizer offers to take small children accompanying their parents SUV to meet again during the subsequent breakfast.